Our June sale includes a wide range of fine instruments, including the work of classical Italians Guadagnini and Landolfi, an exceptional Stainer, early 20th-century violins from Oddone and Fagnola, French examples by Bernardel, Blanchi and Caressa and an excellent late 20th-century instrument by Albanelli. This sale marks the first time that the ‘ex-Sinzheimer’ Guadagnini has been offered for sale publicly in nearly 60 years. Previously attributed to the maker’s Milan period, this exceptional instrument is recognizable to 21st-century eyes as a fine example from the 1773–75 period, when Guadagnini was newly arrived in Turin. Instruments from this period have a flat arch, a golden straw-colored varnish, offset pins on two-piece backs and a reversion to non-oval, Stradivari-inspired lower soundholes. We see twins of this instrument in the 1775 ‘Bisiach, Joseph, Dushkin’, the 1774 ‘Salabue, de Narp’, the 1772 ‘Kaufman’, the 1773 ‘Campoli, Grumiaux’ and many others. The 1937 certificate from Fridolin Hamma states that this violin was played for some years by Carl Flesch. Its first recorded owner, Lene Hesse-Sinzheimer, was born Helene Hesse in 1896 in Mannheim. Her father, Richard Hesse, was the concertmaster of the Mannheim National Theater Orchestra and she later married Max Sinzheimer, who replaced her father as concertmaster of the same orchestra. When she emigrated to the USA in 1939 she joined the Chicago Symphony Orchestra and in her later years devoted herself to teaching. She died in 1957 and the violin was sold in 1960 by Kenneth Warren & Son to its current owner. One of the excellent-sounding violins from the early part of the maker’s Turin period, this violin is in exceptional condition with no internal patches. This 1932 Annibale Fagnola violin is in mint condition. Negligible wear at the edges and a tasteful craquelure throughout are the only indication that the violin was made nearly 90 years ago. The one-piece back is made from a stunning piece of highly flamed maple; the rich red-orange varnish is Fagnola’s best and the model, loosely following Pressenda, is Fagnola’s most desired. This fine and pristine instrument comes to us from Marseille, where it was the property of a professor at the conservatoire who bought several Fagnola violins directly from the maker. Franco Albanelli was a frequent copyist of his teacher, Gaetano Pollastri. This violin dating from c. 1985 shows his fluid interpretive work in the style of Pollastri. The copy differs from the original works of Pollastri in several notable ways: Albanelli purfling mitres have long bee-strings with the outer black strand extending several millimetres beyond the inner; Pollastri locating pins are larger in diameter and usually set on the center joint; the ears of Albanelli scrolls lack the pair of characteristic compass marks we see on Pollastri heads; Pollastri edges are more round and Albanelli arching is more full. Albanelli wasn’t the only prolific copyist of Pollastri, but being a product of the Pollastri workshop himself, his work is perhaps the most legitimate. Lots [84429 and 83364] of this June sale show other late-20th-century Italian copyists at work on the theme of Pollastri. Originally trained as a violinist at the Bologna Conservatory, Romolo Parmeggiani made a small number of exceptionally fine instruments, the best of which rival the work of his Emilian contemporaries, Poggi and Pollastri. This violin dates from c. 1920 and is signed to the inside upper rib. The model is wide at nearly 115 mm in the center bouts and has broad edges with shallow fluting. The warm reddish-brown varnish is of high quality and has slightly penetrated the spruce of the table. The oversized and deeply-cut volute is reminiscent of Gaetano Pollastri and the exacting cornerwork recalls the elegant work of Poggi and Fiorini from the 1920s. Carlo Giuseppe Oddone was one of the few Italian makers to work outside Italy for a significant time and yet despite his exposure to historic instruments while working for Frederic Chanot in London, Oddone instruments, throughout his career, are highly personal interpretations of Stradivari and Guarneri. This 1915 violin is made on a Guarneri model loosely following the ‘Cannon’. The upper and lower eyes of the soundholes are exaggeratedly small, the stems are excessively narrow and the notches are faint. The scrolls of Oddone violins don’t seem to vary by model; this Guarneri head would be just as much in place if set on a Stradivari-model body. The characteristic blacking of the chamfers and the brands to the lower rib and inside blocks are hallmarks of Oddone’s easily recognizable style. This violin is sold with its original bridge with an arched ‘Oddone Carlo’ over a horizontal ‘Torino’. This c. 1785 viola is a reminder that despite the variety of working styles and outputs of Lorenzo Storioni, his work is immediately recognizable for its flat edgework, its angled, Guarneri inspired soundholes and its rich orange varnish, luminous, rich and prone to attractive wear. The maple of the back, ribs and head is visually rustic but typical of other Storioni instruments of the period and of optimal acoustic capabilities. The back and ribs of this Carlo Ferdinando Landolfi violin are made of an elegant birds-eye maple, something seen with some frequency in his work but rarely, if ever, in that of the other Milanese makers before or after him. The pins are typical of Landolfi, set inside the purfling and offset to the center joint. The edges are deeply fluted and form a tight channel all the way into the corners. The head is roughly carved with a straight pegbox, a diminutive volute and a small eye at the end of an extruded second turn. The varnish is an elegant orange-brown color over a bright ground. Based on his broad model, this fine Jacob Stainer violin is an exceptional example of the great Austrian maker’s work. Sold by W. E. Hill & Sons in 1929 and then again in 1943, it was assumed to be original in all parts until a recent dendrochronology examination dated the wood of the table to 1755. The Stainer expert Benjamin Schröder has since corroborated that the violin has a later front and it is being sold as such Nevertheless, it isn’t hard to see how the Hills assumed the violin was authentic in all parts. Like other French makers of the mid-19th century, Auguste Sébastien Philippe Bernardel frequently used elegantly flamed North American maple. This violin dating from 1839 features a glorious one-piece back and matching ribs and head. The label tells us that the violin was made for the 1839 Lorraine Exhibition and it’s clear that Bernardel put his finest work forward. The faint blacked chamfers, the slightly seeped-in varnish on the front and the jet-black purfling are typical of this great French maker. The inscription ‘Raggio di Sole’ (‘rays of sunlight’) to the label of this attractive Rocchi viola is perhaps reflective of its exceptionally golden varnish and sizzling flamed maple. According to the Rocchi family inventory, this viola was originally made as part of a quartet sold by the maker to Mathias Hachen in Liége, who subsequently sold it to an American named William Clark. At some point in the following years this viola, numbered 39, was separated from the cello and the two violins, which bear the numbers 38, 40 and 41 respectively. With a back length of 42.1 cm this model is typical of Rocchi, whose violas are highly regarded for their fine tone qualities. Made as a copy of the 1722 ‘Rode’ Stradivari, this Blanchi violin imitates much of the original Stradivari ornamentation including the mastic inlay to the ribs and head, but curiously omits the most notable feature, the inlaid diamonds and dots which band the edges of Stradivari’s original. The pegs are typical of Genoa makers with a white crescent wedge set into the outer rim of the peg-head. The fingerboard bears a crest with a spread-winged eagle under a crown and the label tells us that the violin was made specifically for a Mr P. A. Concaris of Cremona. This decorated violin by Albert Caressa was awarded in 1924 to the French violinist and composer Eugèn Bozza in recognition of the annual Premier Prix at the Paris Conservatory. 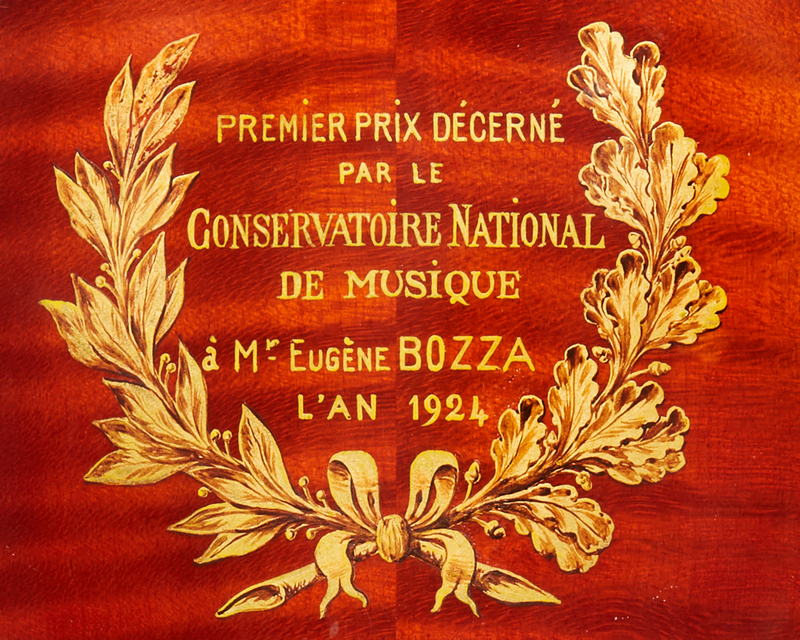 The annual tradition of awarding decorated instruments dates back to 1797 when the Conservatoire de Musique commissioned Nicolas Lupot to make a violin for that year’s competition winner. Over the years that followed this task was undertaken by Charles François Gand, Gand & Bernardel and then in 1901 it was passed to Caressa & Français. View the full June sale online.